Jim McNulty, great-grandson of Westwood Hills Golf Club founder James A. McNulty, sent us numerous photos and information. 7th grade student Emily C. Krause shared the research she did for her “St. Louis Park Then and Now” school project. Debbie Ellsworth wrote a profile of Bob McNulty for the neighborhood newsletter. Please feel free to contact us with additional information you may have. As was much of St. Louis Park, the area that would become the Westwood Hills Environmental Education Center was primarily populated with dairy farms. The acreage included Westwood Lake. It was roughly bordered by what is now I-394, Highway 169, and Texas Ave. In 1928, the Westwood Hills Golf Course opened with 27 holes and 9,405 total yards. It was owned and operated by James A. McNulty (photo at left). Ralph Forbes was the first manager and Pat Johnson the first groundskeeper. Lester Bolstad was the first pro, succeeded by Gunnard Johnson. The golf course was open to the public. It was the only 27-hole course in the Twin Cities. 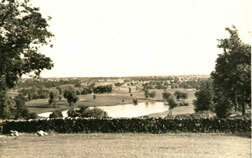 The course was continually improved throughout the 1930s. Through the years, many famous golfers played the links there. The course was a family business that included James’ son John C. and his wife Mildred, and John’s sons Robert James McNulty and John, who ran the golf course for a number of years until Robert redeveloped the property in the 1950s. Joe Bissen notes in his “Lost Golf Courses” article that veteran golfer John Hubbell called it a fun course, but said that there was a lot of peat and could be kind of bouncy. 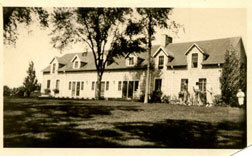 In 1947 one of the first houses was built near the property, owned by Harlyn and Mary Rohr. The house, which is now 8100 Westwood Hills Drive, was so remote that in 1949 the address in the directory was listed as Rt. 9, Westwood Hills Road. The 10th green of the golf course was just outside their back door, and the kids would make money selling balls back to players who had hit them over the fence. 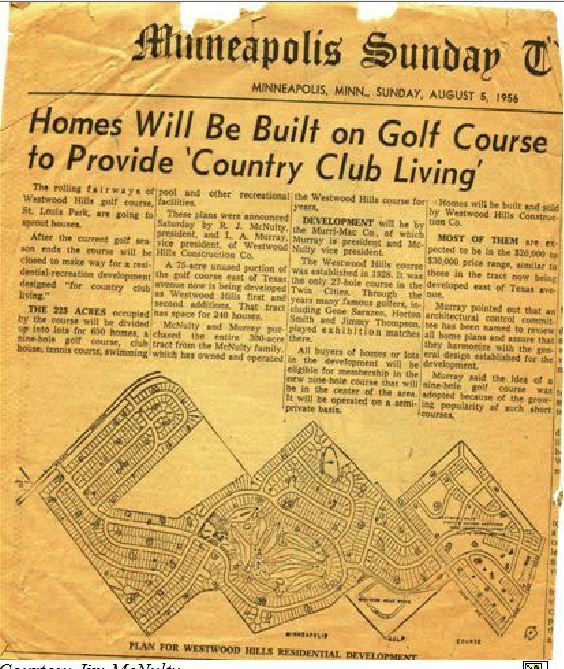 In 1955, the golf course was no longer profitable, and given the rush to build houses in St. Louis Park, the McNulty family began to develop the land for housing. The Murri-Mac company was formed by Robert McNulty to do the land development and he involved Lyle Murray as a partner. The Westwood Hills Construction Company was formed by Robert for the actual home construction. It was a successor to Hyland Homes, which had been the building company of his father, John, and grandfather James A. McNulty. In the fifties the name was changed to Robert J. McNulty Company, and then in 1956 the name was changed to McNulty Construction Company, under which name it continues today. Ted Dietrick and others suggested to the City Council that the City buy up a fair number of the McNultys’ 500 acres for a park. 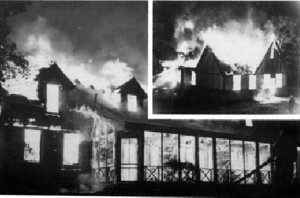 The clubhouse suffered a fire in 1956. 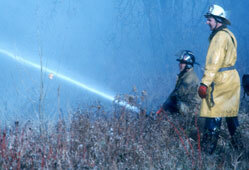 It was put out but reignited, burning the building to the ground. 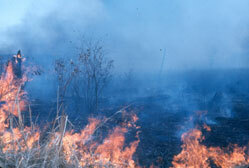 The fire caused $100,000 in damage. 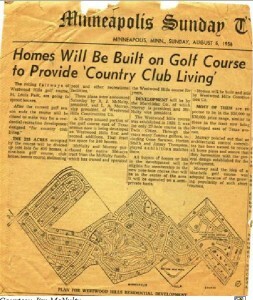 An article in The Minneapolis Sunday Tribune on August 5, 1956, reported that R.J. McNulty and L.A. Murray, president and vice president of the Westwood Hills Construction Co., had purchased 300 acres from the McNulty family for development into residential tracts. 225 acres of the parcel was going to be divided into sites for 630 homes, a nine-hole golf course, clubhouse, tennis courts, swimming pool and other recreational activities. Houses were to be in the $20,000 to $30,000 range, high-end for the time, and subject to architectural approval. The plan changed somewhat as it progressed through the approval processes and various additions; the pool part of it did not became part the development. The other 75 acres, which had not been part of the golf course, were planned to be developed as Westwood Hills first and second addition, with space for 240 houses. The Westwood Hills 1st subdivision, with 149 housing sites, was recorded on September 27, 1955, and was located on the site of four of the golf course’s 27 holes. At this point the golf course was still operating with 18 holes. Westwood Hills 2nd, with 5 housing sites, was recorded on July 9, 1956. Westwood Hills 3rd, with 10 sites on Westwood Hills Drive, was recorded on September 12, 1957. A brochure put out by McNulty Homes offered to take your present home in trade. In 1957, Murri-Mac bought 117 acres and proposed to develop 400-500 homes on 68 acres of the parcel from the golf course and the rest from further north (or possibly east of Texas?). A “Save the Green” committee was formed, with 450 members, trying to stop residential development. The City decided to look at purchasing some of the property. A referendum was held in the spring of 1958 and the City did buy 90 acres of the property. 30 acres were set aside for Westwood Jr. High School, which was originally to be called Westwood Hills Jr. High. This part of the property east of Texas was not part of the original golf course. On August 17, 1959, the Parks and Recreation Advisory Commission recommended to the City Council that the City acquire Westwood Hills Park. The City offered Murri-Mac $200,000. Murri-Mac countered with $230,000. The Council authorized the City Attorney to offer no more than $225,000. A note in the City Council minutes says that the City leased the Westwood Hills Golf Course in 1960 and 1961. The property was also used for day camps, picnics, and winter sports. The golf course was gone by the early sixties – it does not appear in the 1961 directory. Development continued in the area. In 1959/60, a housing development was started on Westwood Hills Drive. A water pipe broke on Franklin Ave., and Westwood Lake started to fill up and flood, killing surrounding trees. Water backed up through the Highway 12 culvert onto Brookview Golf Course, and into Basset Creek. In 1963, the City Council required the developers of Westwood Estates 2nd Addition to ensure that the water of Westwood Lake was controlled by an adequate outlet. Also see the City’s web page for the Westwood Hills neighborhood. In 1971 the City was looking at 150 acres, including 60-acre Westwood Lake, to be developed into what would become the Westwood Hills Nature Center. Borders of the area were Highway 12, Westmoreland Lane, Flag Ave., and Utah Ave. 22 acres of that land was owned by the City of Golden Valley. 16 acres south of the lake belonged to Robert McNulty, and there were six other acres east of the lake. In the Fall of 1971 the City Council named the Westwood Hills Nature Center Citizens Advisory Committee. The property was acquired with Federal, State, City, and private money, including donations from Northwestern Bell, the West Suburban Chamber of Commerce, and Rotary. Acquisition apparently took a long time, as the Westwood Hills Nature Center didn’t open for another ten years. In the meantime, the site was used for summer day camp. 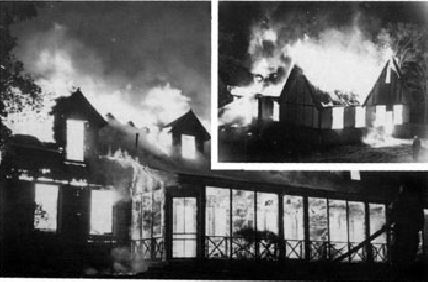 There was a devastating fire in September 1976 that required the services of many fire departments in the surrounding area. The first building of the Nature Center started construction on January 16, 1980, and was completed in February 1981. The first director, Pat Parker, was named in 1982. Honeywell donated an alarm center in June 1982, but vandals caused $1,700 in damage that September. Two houses came with the site, both built in 1935. The “Brick House” (1324 Westwood Hills Road) sits on a glacial morraine, one of the highest points in St. Louis Park. The houses are used for housing for interns, and cannot be sold. Some of the activities that were sponsored by the Center included making maple syrup, an Easter egg hunt, making apple cider, and beekeeping. A honey bee observation apiary was constructed in 1995, and a puppet theater was added in 2000. Over 10,000 school children, public and private, visited the center during 1982-83. The Center was also a site for the Hennepin County Youth Program, where young people between 14 and 21 were paid minimum wage to build trails. Also see the Westwood Nature Center’s web site and a timeline that they have constructed.